According to information posted to Apple's mobile enterprise apps webpage, MobileFirst Apple Watch integration appears to be basic extensions of host iOS apps, providing professionals access to notifications and alerts on the fly. For example, healthcare app Hospital RN keeps nurses up to date on patient requests, changes in lab status, safety alerts and task lists by pushing notifications to Apple Watch. With vital information accessible at a glance, healthcare professionals can devote more time to patient care and less time on their iPhone. 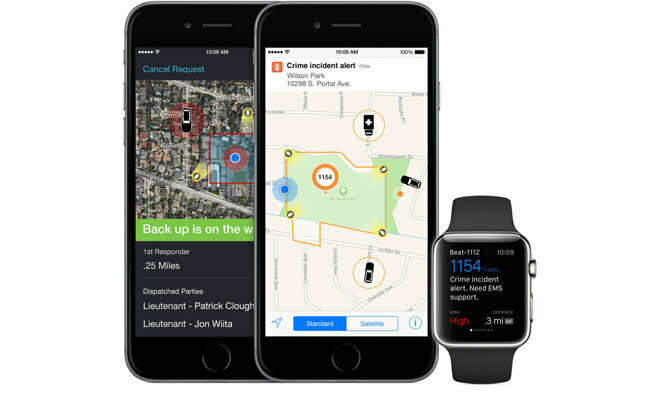 Public safety app Incident Aware, which debuted as a MobileFirst launch title in December, bakes in similar push notification features that send urgent alerts to Apple Watch-wearing officials. In the example image, seen above, Watch displays a brief description of an emergency, its risk level and current distance to incident. Finally, Field Connect's Watch app keeps personnel in the energy and utilities industry aware of adverse working conditions while on the job. Technicians working on power lines, for example, may get advance warning of high winds in the area. Apple and IBM are expected to continue rolling out Apple Watch support across the MobileFirst suite of apps, though an exact availability timeline is unknown. The MobileFirst initiative was announced last July and promises to yield more than 100 apps built around Apple's iOS platform. Under partnerships terms, IBM handles hardware leasing, device management, security, analytics, mobile integration and on-site repairs, while Apple aids in software development and customer support through AppleCare.